"This is a nice change from the traditional mix you bake in the oven." 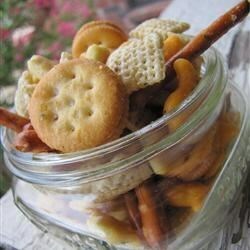 In a large bag or bowl, combine cereal, goldfish crackers, pretzels, nuts, oyster crackers and sandwich crackers. In a small bowl or shaker, combine oil and dressing mix. Toss cracker mixture with oil mixture. Serve. Very good. Shook ingredients in paper bag to absorb some of the oil. uuuuuuuummmmmmmmm uuuuuuuuummmmmmm good!!!!!!! the only problem with this is that you cant stop eating it and people always pick out the peanuts(lol lol lol)..